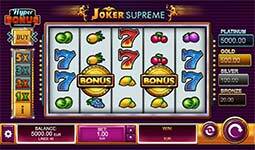 Joker Supreme slot machine by Kalamba Games has 40-lines across 5-reels and captures a classic slot theme beautifully with clean, slick graphics and animations. Hyper Bonus, player selected multipliers, bonus jackpots and a free spin collection mechanic are just a few in-game features that give an added twist to this masterpiece. Joker Supreme offers an RTP up to 97.12% and a max win of up to 5000x your bet! Multiplier Wild Feature – Multiplier wild symbols substitute for all symbols except the Bonus symbols and jackpot symbols. When a multiplier wild symbol occurs in a winning combination, the pay for the winning combination is multiplied by the value on the Multiplier Wild. Hyper Bonus – Choose different bets to play the higher Multiplier Wild values and more initial free spins. Select a Free Spins bonus and play it right away. If you select to play a Hyperbonus Bet, a free spins bonus is awarded immediately with a Multiplier Wild value and a number of initial spins according to the selected bet. Bonus Jackpots – Have your chance at winning four different jackpots including bronze, silver, gold and platinum! When you win a Bonus Jackpot, you are awarded the value displayed on the interface for the level of bonus jackpot won at the time that it is won. Free Spins Bonus – When three bonus symbols appear, the game initiates the Free Spins bonus. The number of initial free spins depends on the selected feature bet value. During the free spins bonus, each bonus accumulator symbol increments a counter. For every 3 bonus accumulator symbols that are collected during a Free Spins bonus, 3 additional free spins are awarded.